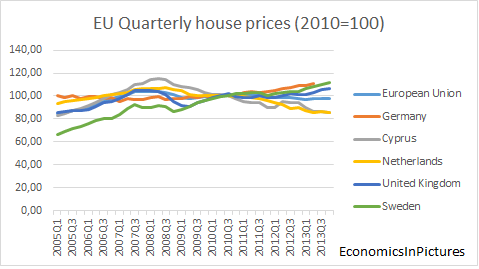 With new data from Eurostat for the percentage change in q4 2013 of the house prices in the EU I constructed this graph. During the last quarter of 2013 the United Kingdom and Sweden saw big increases in their house prices, while house prices in the Netherlands and Cyprus decreased. For the EU as a whole house prices decreased with 0.1 percent compared to Q4 2012.